What were the big issues for General Election voters in Radlett? About a week ago, just before the 2017 General Election, we asked you which local issues would motivate you to vote. We did this for the last election too, back in 2015. So, in order of importance to you, here are the issues that got the Radlett electorate voting, with the 2015 position in italics and the number of votes for each issue (in brackets). The NHS has displaced the freight terminal as your number one concern since 2015, the Newberries car park redevelopment is a new entry at number nine and, although we were really expecting you to tell us that Brexit trumps everything else, it was the second-least important issue in the survey. Does this reflect a national loss of interest in the mechanics of Brexit, now that it’s a done deal? And will the biggest electoral surprise in decades throw the whole Brexit calculation in the air again anyway? It’s also fascinating that schools have dropped from number eight to last place. The huge cuts coming down the pipe for all state schools are clearly not freaking out the population of Radlett. Our 2017 election survey results are here. And you can read the 2015 results here. And on the national scale, Tory donor (and noted tax avoider) Lord Ashcroft runs a large and detailed survey of UK voters after every major vote. His most recent data is absolutely fascinating. He shows, for instance, that the only age group that voted majority Conservative in last week’s election was the over-55s. Blimey, what a night. 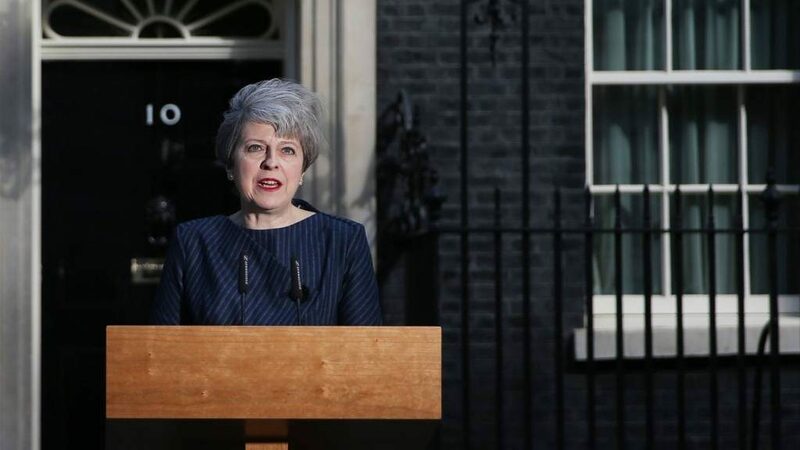 British politics has been turned on its head. Young voters have challenged the electoral status quo as never before. A Prime Minister brought low by hubris. But you don’t want to know about all that. You want to know what happened here in Hertsmere, right? As expected, it was not an exciting night in Hertsmere. 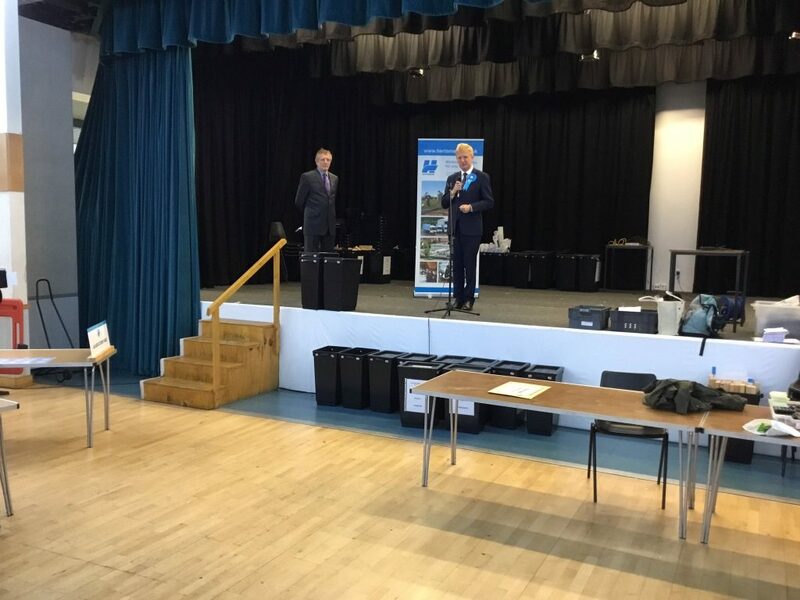 The photograph (from Hertsmere Borough Council on Twitter), taken during Oliver Dowden’s acceptance speech, properly expresses the frenzy at the count in Borehamwood. It was a good night for Dowden, though. He was re-elected with more votes and an increased share. He’s won a smaller majority though, and that’s all about a substantially better performance from Labour and the collapse in UKIP’s vote. Fiona Smith, a first time candidate for Labour, built on Richard Butler’s work in 2015, taking Labour’s vote to 14,977, over 6% more than in 2015 and a 28.7% share, the party’s highest since 2001. I predict a solid political future for Fiona Smith. UKIP’s loss mirrored the national numbers. David Hoy polled only 1,564 votes, 75% fewer than in 2015. The Liberal Democrats polled almost exactly the same as in 2015, which itself was a thirty-year low point, and the Greens’ return to Hertsmere politics made essentially no difference. Return to two-party politics, anyone? Turnout was 71%, the best since the high water mark of 1997, when it was 74%.